Occupational Hazards of Musclepalooza XVIII: Clean up in aisle one! Hemmings Musclepalooza XVIII, Lebanon Valley Dragway. Photography by the author. Hemmings Musclepaloozas are a great venue to see hundreds of beautifully restored muscle cars and our Best-in-Show awards are always a highlight of the event. 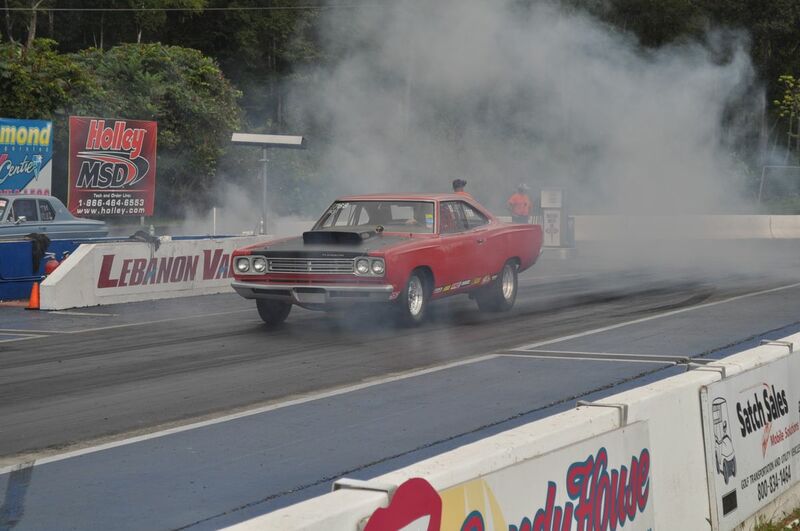 But, also taking place at the same time as the car show and even for a few hours after trophies have been handed out, is some really competitive drag racing. After the parade of show car winners at our fall event, I moved over to the drag racing starting line to get a few shots of the race cars, hoping to catch a smoky burnout or wheel standing launch. What I got was a scary wake-up moment. 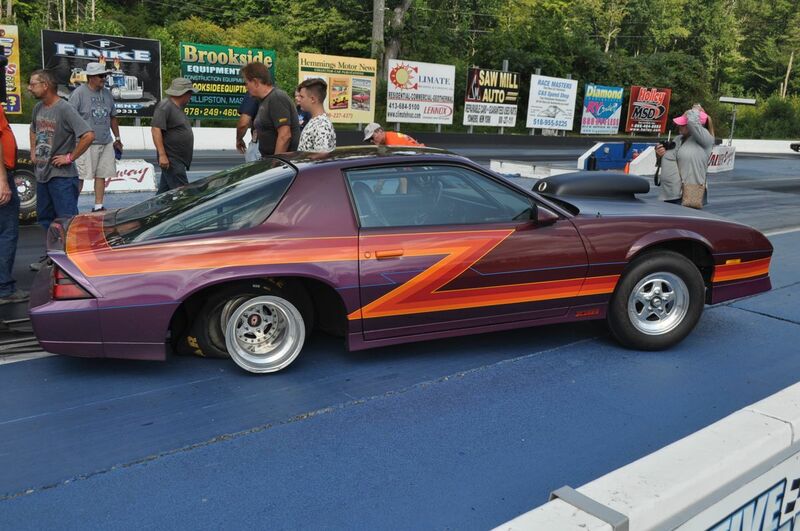 Racer John Paquet of Middleburgh, New York, has been racing at the Lebanon Valley Dragway for more than 10 years in his third-gen Z-28 Camaro with a 600-cu.in. Chevrolet big-block engine. 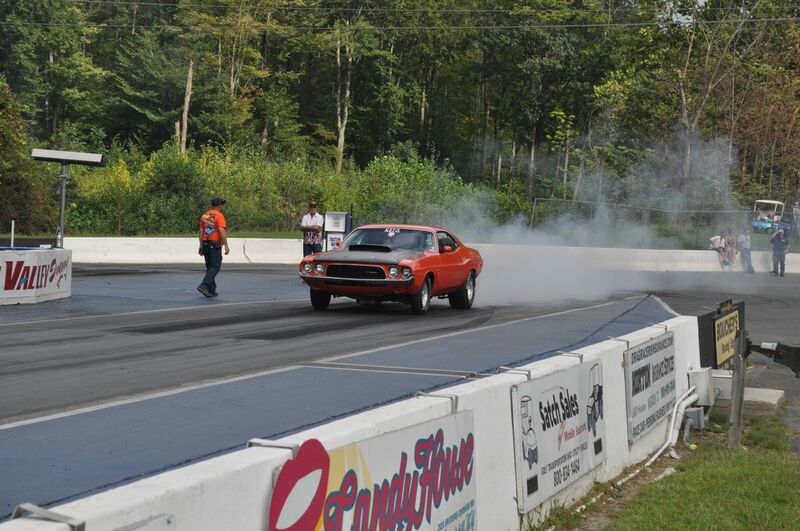 He runs consistently in the 10-second range (he was dialed in at 10.00 that day) and the car will easily grab some air as it launches away from the tree. I grabbed a shot of his car approaching the line and was aligning my lens for a shot of his launch when the lights turned green and John took off. 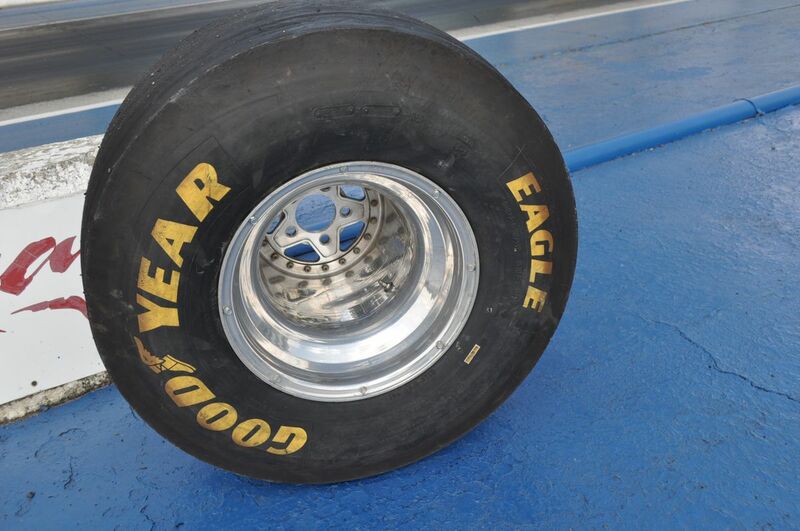 However, as he left the line, all five of the wheel studs on the left rear wheel sheared from the rear axle torque and spit the left rear tire out of the back of the car, and launched it towards me, a mere 12 feet from the line. The tire bounced off the retaining wall in front of me and then jumped about 5 feet into the air as it caromed off the wall, and across both lanes and over to the opposite retaining wall. In the meantime, John’s Camaro was spinning around in the lane and the right rear quarter panel was heading straight to where I was standing. 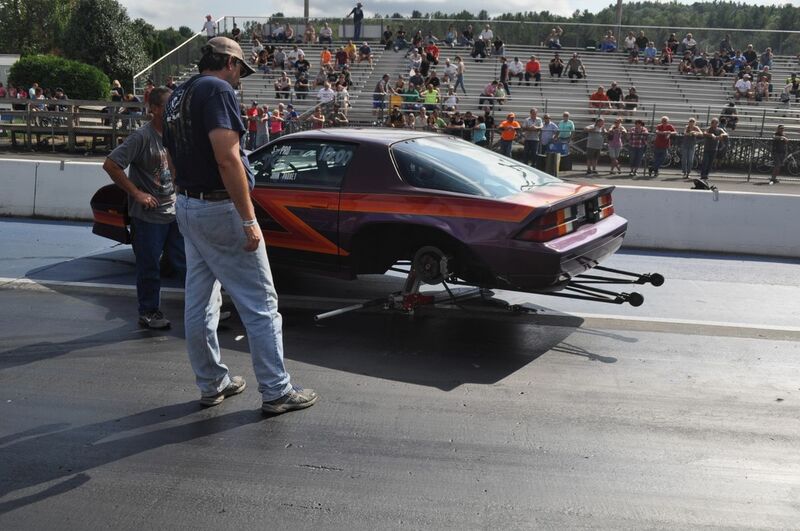 As I tried to move out of the line of fire (which seemed to take minutes, not seconds or split seconds), the right rear tire on the car spun off the wheel and lodged underneath the rear axle as it was about 180 degrees into its spin. 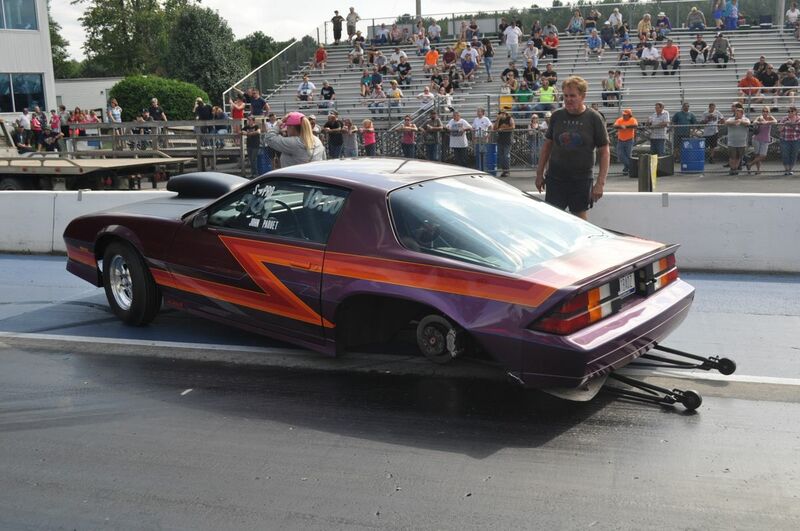 Fortunately for me, the caught tire slowed the Camaro’s spin and the car stopped within a few feet of the retaining wall without doing any more damage. John being the expert racer he is shut the engine down at the first sign of trouble, preventing any chance of fire or damage to the racing surface…or me. 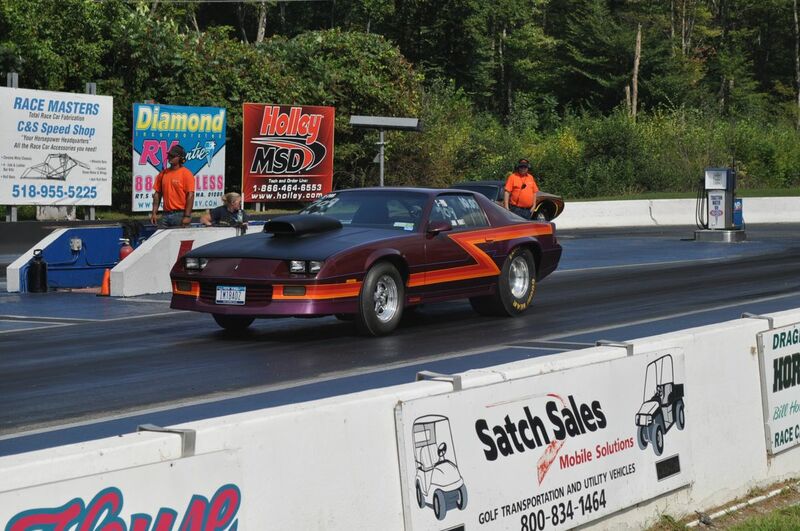 After some fidgeting around with a floor jack under the rear subframe, the race track’s flatbed hauler was able to winch the car off the racing surface by rolling the car onto the flatbed using John’s wheelie bars. There was no damage to the track and we were able to find two of the five broken studs, which had sheared right at the mounting surface. The other three could have been anywhere, given the ferocity at which the tire broke loose. 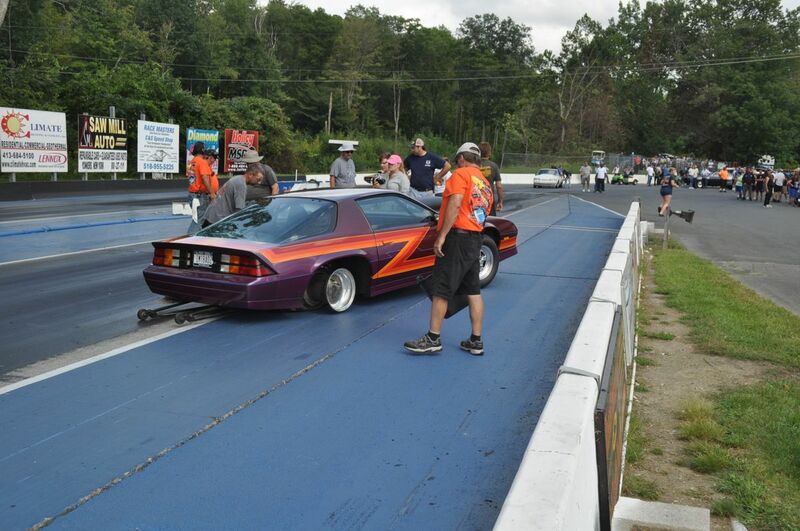 The racing surface was checked, I checked my shorts, and everything was good to go for some more drag racing. 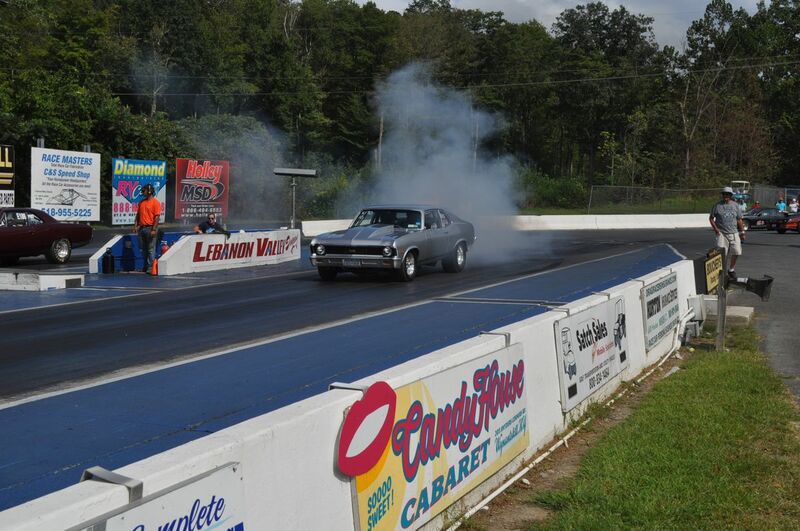 We here at Hemmings Motor News and Hemmings Muscle Machines magazine want to thank everyone who attends and supports these events each year, especially the drag racers who allow us to interrupt their racing to take car of our car show business.